Readers of the Washington Post, Seattle Times, and San Francisco Chronicle awoke this morning to a full-page ad from Tiffany & Company congratulating the U.S. Environmental Protection Agency. The reason? 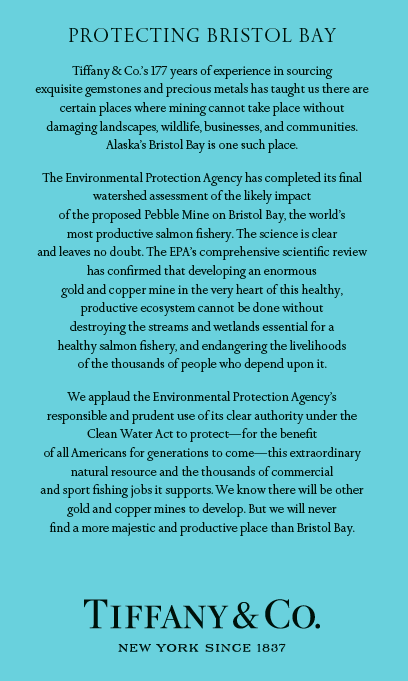 Last week EPA announced that it was initiating a public process to consider vetoing or regulating the proposed Pebble Mine in southwest Alaska -- a project that threatens the most productive wild salmon fishery in the world, the Bristol Bay fishery. Tiffany's is no stranger to this controversy. Over the last five years, it has repeatedly stated its opposition to the mine and even committed that, if it ever gets built, the jeweler will refuse to source any gold from the project. Led by Tiffany's, some 50 other major jewelers have made the same pledge. This opposition from an industry that depends on mining is perhaps the clearest illustration of the fact that the Pebble Mine is a uniquely irresponsible mining project that must never be developed. We applaud Tiffany & Company for its leadership in opposing this uniquely reckless mining project. The headwaters of the greatest wild salmon fishery in the world -- a fishery that produces 30-50 million wild salmon each year, generates $1.5 billion in annual revenue, and creates 14,000 jobs -- is no place for large-scale mining. 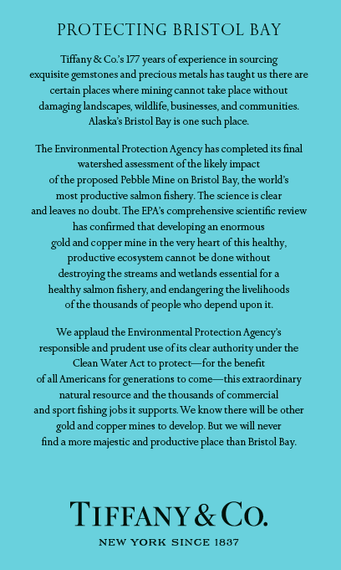 EPA has done the right thing in intervening to stop the Pebble Mine, and NRDC and its members are committed to continuing our efforts to that end -- however long it takes to achieve it.